I've heard of the Black-Scholes equation, but I'm interested in finding more about it. How much is it related to the Gaussian model of risk, whose widespread use was blamed for the 2008 financial crisis, and of which Henri Poincaré had given his 'Panurge's sheep' warning a century before in 1908? And in 1998 the Long-Term Capital Portfolio hedge fund, which used the Black-Scholes model, collapsed. Did complicated mathematics hide the flaws in the model? I hope that this book will explain what went wrong. The book tells of how the rise of financial trading, such as the Dutch tulip mania, or the selling of shares in overseas trading companies, led to the need for some sort of options trading. The Black-Scholes equation is presented as the finding of an exact formula for options prices, something which traders had sought for several centuries. So am I right is assuming that it is dependent on assumptions about risk? I'm looking to the rest of the book to explain this to me. The book approaches the Black-Scholes formula with a history of the mathematics leading up to it. After the early attempts to understand the behaviour of financial markets we hear of the impressive work of Bachelier at the start of the 20th Century. At the same time Einstein was working on essentially the same problem, that of Brownian motion. The book goes into some detail comparing the study of this problem in financial theory with its study in the physical sciences. In the following years, however, little notice was taken Bachelier's work, and that seems to be the theme through the next few decades. There were several contributions to the subject which were ignored or lost, largely due to the interference of the world wars. After the second world war Paul Samuelson got to work modernising economics, and in the context of financial markets pointed out that it makes more sense to consider the logarithm of a share price rather than the share price itself. There then followed more focused work on options pricing, culminating in the derivation of the formula in the early 1970's by Black, Scholes and Merton. The book then looks at their subsequent careers, and in particular the spectacular rise and fall of LTCM. I do feel though that the book could have included an important point: that it's all to easy to assume that things are uncorrelated without really noticing the assumption. Szpiro explains that Ludwig Boltzmann gave a statistical mechanical proof that entropy increases with time. The trouble is that deriving a time asymmetric result from time symmetric assumptions doesn't make sense. What distinguishes the past from the future is that past motions of interacting particles are uncorrelated, whereas the future motions are correlated. Getting on to finance, we hear of how impressed Poincaré was with the work of Bachelier, but not of his 'Panurge's sheep' warning mentioned above. Benoit Mandelbrot and Eugene Fama are mentioned separately in the book, but not the worries that Mandelbrot had about Fama's use of gaussian models (which assume uncorrelated inputs). You can read more about these issues in Alan Kirman's paper Plight of the fortune tellers. Some relevant points are mentioned by Szpiro though. An idea to profit from trading in low-beta stocks was shot down because of such stocks are correlated among themselves. One of the problems LTCM faced was that it was such a major player that the bahaviour of stocks it traded became correlated simply because others knew LTCM was trading in those stocks. And the final chapter looks at how gaussian models contributed to 2007 financial crisis, although that's just a few pages. Maybe I shouldn't complain because Spiro didn't write the book I would have liked to read, but I did feel that there was something missing while I was reading it. Apart from that though, I felt that reading it was very worthwhile. It explained well where the Black-Scholes formula came from, and why it was such an impressive result. It also showed how convoluted the route to such a result can be. And it managed to cover a technical subject in a very readable way. 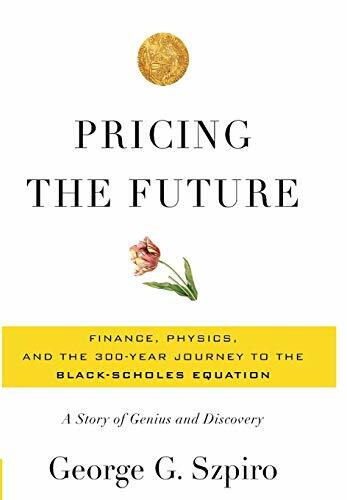 So if you want to know about the Black-Scholes formula then you should give this book a try.